I have a strange relationship with books. As a child, I would re-read my collection of books constantly and it’s a (bad?) habit that’s stuck with me. Books I’m not sure about I’ll read three or four times, whilst novels I enjoy will be a minimum of six or seven. There are many books I’ve read literally hundreds of times. Sometimes passages from books I’ve loved over the years will just appear in my mind and recite themselves. I know it seems a strange use of time to just compulsively re-read everything, but I’m quite a fast reader and I probably get through about 50 new books a year as well as re-reading everything else. It’s a strange structure, and I know that, yet I still do it! I think my least favourite feeling is when something reminds me of a story, but I’m unable to recall exactly the character or title. I’d much rather have entire chapters to hand. Every month I pick out my reading, and roughly every other book will be a re-read. 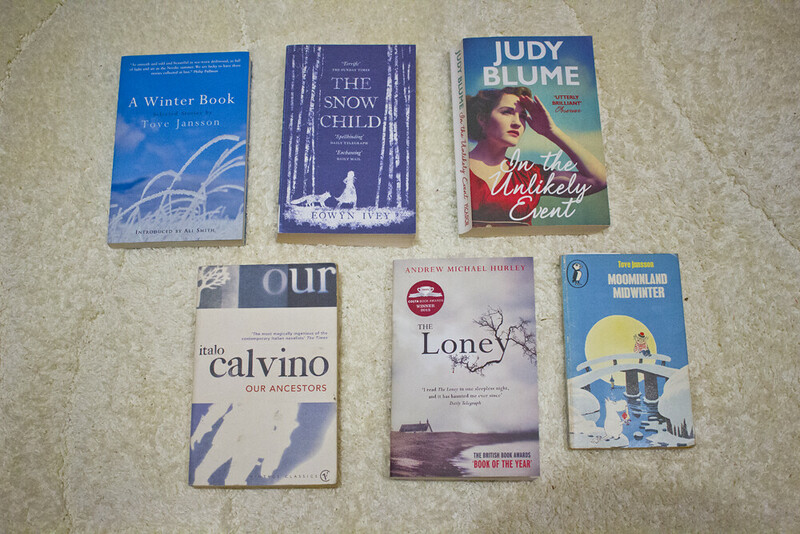 I thought I’d share with you the books I’ve brought to New York – a selection of old favourites and new things. A Winter Book was the last story collection published in Tove’s lifetime. The short stories within it are drawn primarily from other collections and cover a huge range of themes. Since A-Levels I’ve been a short story fan, and I’m also (as you know) an admirer of Tove’s writing. This will be my first re-read of the book since visiting Finland and Tove’s native Helsinki. This will be my first re-read of this book, so in Laila terms it’s still very new to me. I first read this novel about two years ago over the course of just one evening. I’m a big fan of magical realism, so should have fallen head over the heels of this book. Set in bleak Alaska, the imagery throughout is beautiful; snowy, stark and the perfect setting for a bit of magic. However, when I finished it previously I felt let down by the abrupt ending. The final act of the book is what undid a lot of the magic for me, but I’m hoping the re-read will feel different. I grew up with Judy Blume and her fantastic, informative, challenging books for adolescents. I’m sure many of you did too! This is her most recent novel and her fourth book for adults. I’m currently about halfway through – it’s a beautiful novel so far, with a wide range of characters and her trademark insight into people’s innermost thoughts. It reminds me of being a teenager in the nicest possible way. Set in New Jersey during the winter, 1951, I particularly enjoyed Part One detailing Christmas in New York. As you know, I’m currently off celebrating Christmas in New York..! With ‘Our Ancestors’, Calvino’s trilogy of allegorical fantasy novels, I’ve actually previously read two of them as stand alone titles – ‘The Cloven Viscount’ and ‘The Nonexistent Knight’. I didn’t realise they were connected into a trilogy until somebody recommended me the complete trilogy during my Masters, at which point I barred myself from re-reading any of the stories unless it was as part of the trilogy. I’m exceptionally bad at reading novels in the series as they were intended (see also: listening to albums as intended). Anyway, that was 4 years ago! I’m just getting around to reading the full thing now but really looking forward to it. I’ve not actually read this book before! My pet hate is people publishing book “reviews” without having actually read the book, but as I was packing these books I figured I’d just include it and maybe have read it by the time I was in New York. I haven’t, evidently. I’m a bit put-off by the Costa sticker – what do Costa know about literature? – but I do love a good mystery, particularly if it’s set on a isolated, bleak island. So I’m trying to ignore my inner snob and give the book a chance. Have any of you read it? Here’s a book I re-read every winter. It seemed stupid to pack it as it’s such a short read but I knew otherwise I’d want to read it and end up buying a copy somewhere, and that’s more stupid. Moominland Midwinter is a lot more introspective than the previous Moomin books. Tove used the book to explore themes of loneliness and isolation and the result is a beautiful, peaceful book. Like the rest of the Moomin series, it was written for children, but there is a huge amount of insight and philosophy to be found – similar to Tove’s writing for adults. "Get To Know Yourself: MBTI Personality Types"
I love re-reading book, Great Expectation being one that I really love to re-read! 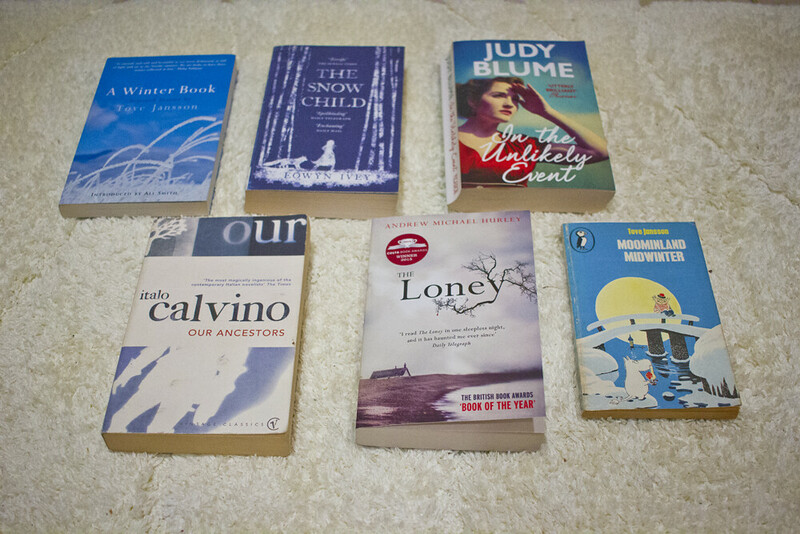 So I loved your selection now, some to re-read and one to read for the first time. I would love to read The Snow Child, since I have always wanted to go to Alaska and the descriptions must be great! Also, Our Ancestors and A Winter Book trigger my curiosity! I hope you have a great trip and Christmas! I’ve actually never read a Judy Bloom book… I think I should go do that! Which books have you read over and over again? That’d make a very interesting post 🙂 I’ve read the Harry Potter series, One Day, and Gone With the Wind multiple times!